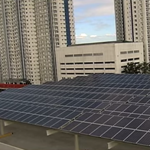 Solar Philippines Commercial Rooftop Projects Inc recently completed (November, 24, 2014) installation of a 1.5-megawatt solar plant on the roof of the SM North Edsa shopping mall in Manilla, Philippines. 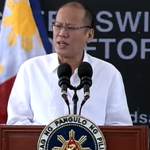 That amount of power is enough to provide energy for about 2,000 Filipino homes, and will also offset approximately 40,000 tons of carbon dioxide (CO2) during the next 25 years. 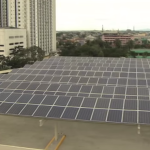 World’s largest Solar Powered shopping mall in Manilla Philippines. 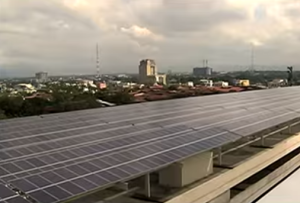 This solar array makes shopping at the SM North Edsa shopping mall more of a green sustainable shopping experience and the carbon saving equivalent of planting 200,000 trees. 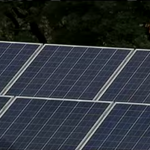 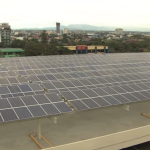 This particular new Filipino solar energy plant consists of 5,760 individual solar panels, 60 inverters and covers a surface area of 39,370 square feet (12,000 square meters) and also doubles as covered car parking. 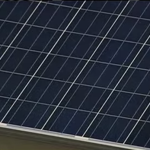 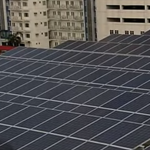 The SM North Edsa shopping mall installation is the largest solar power project competed to date by Solar Philippines, thought they recently they also installed a 700-kilowatt solar power facility for the Central Mall Biñan of Premiumlink Development Corp. Several other solar power projects are currently in progress.